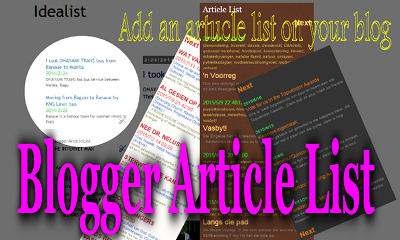 "BloggerArticleList" Adds an articles list on Blogger blog website. The articles list is displayed as a blog gadget or a blog page. The articles list is made automatically and updated whenever new article is posted. The articles list is customizable design, so it fits any blog. A sample blog is here. If you want to make new BloggerArticleList, enter your blog address and the password. If you are using BloggerArticleList already, enter ID and the password. Copyright (C) 2010-2019 THE INTERNET MAN. All Rights Reserved.